Chocolate Cherry Mice are the cutest little Christmastime treats! 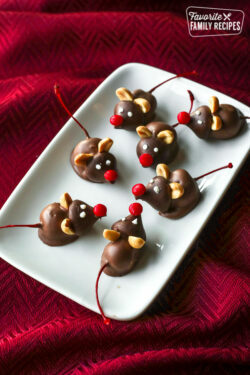 Creamy chocolate covered cherries with an adorable mouse face that kids love to make and eat. In the microwave or over the stove, melt the chocolate chips and shortening together. Stir until smooth. Holding a cherry by its stem, dip it into the chocolate and then press a chocolate kiss onto the cherry. Wedge peanut halves between the cherry and chocolate kiss to make the ears. Place this on wax paper until chocolate dries. Add a couple dots of white frosting for eyes, then put a little melted chocolate on a red-hot and place on the end of the kiss to make the nose.